The HP Color LaserJet 3600n series is a medium-sized, speedy color printer, perfect for a small office. This printer is intended for low to medium volume color printing. Our refurbished 3600n includes a 250-sheet paper tray plus an Ethernet port for connecting the printer to a network. Compared to HP's latest line of smaller color LaserJets, a refurbished 3600n can save you a bundle in printing costs! Check out toner cost comparisons below -- you'll be surprised at the savings! 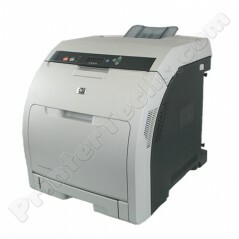 LaserJet 3600 remanufactured toners are readily available and reasonably priced. Toner cartridges for new printers tend to be ridiculously expensive. See below for a cost analysis.